Paris-Michael Katherine Jackson is the only daughter of Michael Jackson with Debbie Rowe. Ever since a child she has stayed away from the limelight. She made her first public appearance when she was 11 years old. She appeared in the television documentary Living with Michael Jackson in 2009. Jackson was to Debbie Rowe and Michael Jackson born on 3 April, 1998 in California. Jackson’s parents divorced when she was just one year old and was raised by her father solely. She grew up with her siblings Neverland Ranch. She and her siblings often wore masks during public appearances to hide their faces from the media. When Michael Jackson made friends with Elizabeth Taylor and Macaulay Culkin, they acted as Jackson’s God parents. After the death of Michael Jackson she and her sibling came under the legal care of their grandmother. Jackson signed to star in a children’s fantasy film Lundon’s Bridge and the Three Keys. The film is an adaptation of a book written by Dennis Christen. Jackson has appeared in Michael Jackson Memorial Service in 2009, The 52nd Annual Grammy Awards and Oprah Winfrey Show in 2010. She also performed in The X Factor and appeared as a guest in The Ellen DeGeneres Show in 2011. In 2012, she appeared on Oprah’s Next Chapter. Jackson as a child has been a victim of cybercrime. She was hospitalized in 2013 following cuts on her wrists with a kitchen knife and consuming 20 ibuprofen tablets. 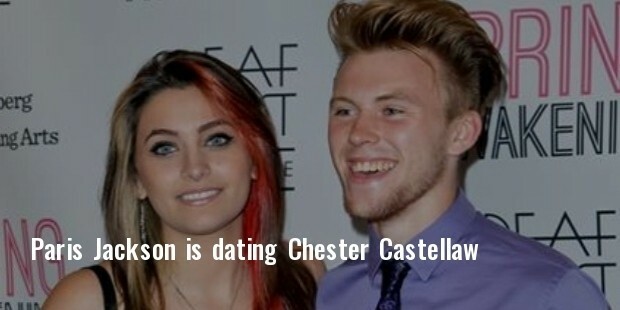 Currently she is dating Chester Castellaw and the pair walked the red carpet together. Jackson made it to the Most Beautiful list by People’s magazine in 2012.